The team has been tapped to build an integrated-photonics modem, employing the emerging, potentially revolutionary technology that may transform everything from telecommunications, medical imaging, and advanced manufacturing to national defence. The mobile phone-sized device incorporates optics-based functions, such as lasers, switches, and wires, onto a microchip - much like an integrated circuit found in all electronics hardware. The device incorporates an emerging technology - integrated photonics - which is expected to transform any technology that employs light; everything from Internet communications over fibre optic cable to spectrometers, chemical detectors, and surveillance systems, to name just a few. “Integrated photonics are like an integrated circuit, except they use light rather than electrons to perform a wide variety of optical functions,” said Don Cornwell, director of NASA's Advanced Communication and Navigation Division. Recent developments in nanostructures, meta-materials, and silicon technologies have expanded the range of applications for these highly integrated optical chips. Furthermore, they could be lithographically printed in massive quantities - just like electronic circuitry today - further driving down the costs of photonic devices. “This technology will enable all types of NASA missions, not just optical communications on LCRD,” Cornwell added. “We've pushed this for a long time,” said Mike Krainak, who is leading the modem's development at NASA's Goddard Space Flight Center. It should be a massive upgrade, and a key part of NASA's multi-year Laser Communications Relay Demonstration, or LCRD. Since its inception in 1958, NASA has relied exclusively on radio frequency (RF)-based communications. But with today’s missions demanding higher data rates than ever before, the need for LCRD has become more critical. The project promises to transform the way NASA sends and receives data, video and other information. It will use lasers to encode and transmit data at rates 10 to 100 times faster than today's communications equipment, requiring significantly less mass and power. Such a leap in technology could deliver video and high-resolution measurements from spacecraft over planets across the solar system - permitting researchers to make detailed studies of conditions on other worlds, much as scientists today track hurricanes and other climate and environmental changes here on Earth. 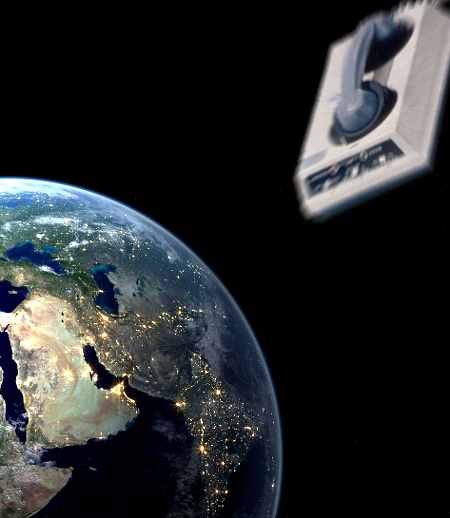 It means the new modem will have to be tested in space. LCRD is designed to be an operational system, involving a set of equipment hosted in orbit, and two specially-equipped ground stations. The mission will dedicate the first two years to demonstrating a fully operational system, from geosynchronous orbit to ground stations. Once NASA demonstrates that capability, it plans to test communications between geosynchronous and low-Earth-orbit spacecraft, NASA says.